Outsell announced today that its Vice President of Marketing Valerie Vallancourt has been invited to speak at Digital Dealer 24, moderating a panel titled, “Finding Your Next Customer: It’s All In the Data.” Panelists are Brian Pasch, Founder at PCG Companies and Paul Schnell, Digital Marketing Director at Wilsonville Toyota and Wilsonville Subaru, the largest Subaru store in the U.S.
Consumer data is rich with insight. Dealers can leverage the data in their CRM and DMS systems by applying simple artificial intelligence, data mining and other techniques. This session covers how to retain more customers, increase conversions, improve engagement and find your next customer by better understanding a dealer’s in-house data. Learn data techniques to better analyze and understand their in-house data. Gain a checklist of items to bring to their next marketing meeting to address how to best leverage in-house data and improve marketing communications at the dealership. Learn directly from a dealer about how they used new methods to analyze their own customer data and achieve results. 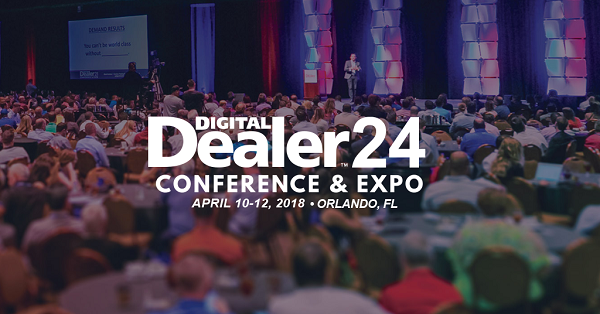 Digital Dealer 24 in Orlando, Fla.